In the mid-1800s Western powers began demanding trade and diplomatic relations with Japan, and the Japanese were offended. Many if not most Japanese saw their homeland as having been founded by their supreme god, the Sun Goddess, and seeing their country as connected to the will of the gods they saw it as a "divine land" and as superior to other nations. Some among the Japanese saw foreign mannerisms as stupid and referred to foreigners as barbarians. They considered foreigners arrogant in making demands upon the Japanese. They believed that the foreigners had to be driven away for the honor of Japan and the preservation of all that was dear. Since 1603 Japan had been ruled by the Tokugawa family, a military rule from Edo (present-day Tokyo), with the male leader of the family holding the title of Shogun. The Tokugawa family was Buddhist, as was Japan's emperor, who had become a figurehead, surrounded by a few advisors and bureaucrats at his palace in the city of Kyoto. The de facto national flag by 1868. The white stands for honesty and purity, the red for sincerity and passion. A challenge to Tokugawa rule came from territorial lords (daimyo), rulers of the 250 or so fiefdoms (han) that divided Japan. 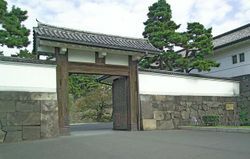 The Tokugawa dominated the lords militarily, and the shogun had checkpoints (seki) at strategic locations along Japan's main roads to prevent any activity hostile to his power. It was a military superiority benefiting from a monopoly on the main ingredient in gunpowder – saltpeter – available only through imports from abroad, with the Tokugawa shogun in control of importations. The result for Japan was a couple of centuries of stability and no major civil wars. There were peasant disturbances – to be counted at 1,809 between the years 1590 and 1867. Japan was also experiencing the usual periodic floods and typhoons, droughts, locust infestations and major famines, including the famine of 1833-36 which killed thousands upon thousands of people – 80,000 in one location alone. But under Tokugawa rule agricultural production increased, with more use of fertilizers and a greater variety of crops, the greater agricultural production stimulating Japan's money economy and the growth in the number and size of towns. And fishing remained an important industry, as was mining, forestry and handicraft industries. With the growth of commerce and demand for goods but little increase in production, inflation increased, and there was an increase in wealth disparity. Peasants complained about being over-taxed, which included payments of a portion of their crops to the lords. The poor were resorting more to abortion and infanticide. Wealthy merchants, meanwhile, acquired the right to have surnames like the aristocrats, and to wear a sword. They had begun to act like aristocrats, practicing the military arts, studying Chinese books, reading poetry, and paying for visits by prostitutes. Meanwhile the warrior aristocrats – samurai – remained vassals of territorial lords and grew accustomed to a more elaborate lifestyle, while many of them were becoming more dependent on money lenders. An increase in contact with foreigners introduced the Japanese to the West's superiority in weaponry, technology and science. Scientific books from the West increased, including works on medicine and astronomy. These were translated largely by government employees, the rangaku-sha. Religious books or books using the word "God" were not accepted by the Tokugawa government. Christian missionaries were still forbidden entry to Japan., while some technology experts from abroad were. The Tokugawa shogunate wanted to prevent the fate that had befallen China, and in the 1850s it submitted to a number of "Unequal Treaties" with Britain, the United States, France and Russia. The treaties opened the cities of Edo and Osaka to foreign residents, and ports were opened to foreign ships. In these ports Westerners were granted extraterritorial rights – exemption from Japan's laws. And the Western Powers took control of Japan's foreign-trade tariffs, creating a trade balance unfavorable to Japan. Commerce with the West increased in the early 1860s, and in the 1860s Japan's more curious and sophisticated developed a greater interest in things from the West -- gadgets, food, clothing, music and the arts – while those passionate about Japan as a divine and superior land were increasingly offended. In the early 1860s, religious and chauvinistic Japanese began a campaign of terror against Westerners and those who accommodated Westerners. Civil war erupted in 1863, and among those opposed to the foreigners were advisors around the figurehead emperor, Komei.